Adoring Fan is a unique legendary Neutral creature card. It is part of the Core Set. You receive one the first time you defeat a Solo Arena boss, or the first time you finish the Versus Arena with seven wins. Finishing a Versus Arena during the Chaos Arena event with seven wins will also provide you with a copy of the card. A premium version is awarded when reaching the rank of Grand Champion in either Solo Arena or Versus Arena. The somewhat cryptic text "Adoring Fan will return" means that, after it is destroyed, it will be summoned into either lane at any point during the game from the discard pile. "Can I carry your weapon? Shine your boots? Back rub, perhaps?" "You won't get past me!" "I'll be around the arena grounds. Shout if you need someone to cheer you on!" "I might be your greatest fan!" "Shout if you need someone to cheer you on!" 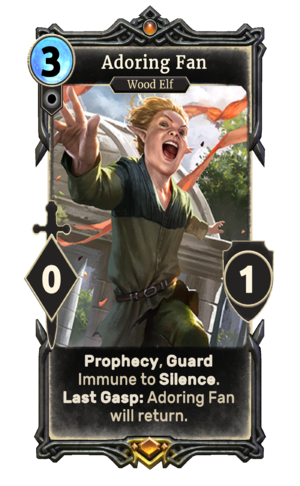 The Adoring Fan is a reference to Oblivion's Adoring Fan, who became a follower in much the same way as this card is earned and would eventually respawn if killed. This card cannot be seen in your collection, even when viewing unowned cards, until you have earned it. This page was last modified on 15 February 2019, at 22:06.